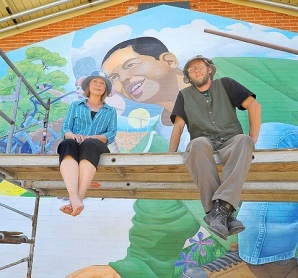 Mural with artists Pamela J. Smith and R.E. Wall. A mural of children at an Arizona grade school is apparently way too colorful for some white residents including a city councilman. Artists who created the mural have been asked by the school principal to repaint the Black and Latino children on the mural as light skinned. Faces in the mural were drawn from photographs of children attending the school. You are currently browsing the White matters blog archives for June, 2010.